TyphonRT helps anyone develop, design, and engage people through creating better apps and games for Java, Android, and beyond. 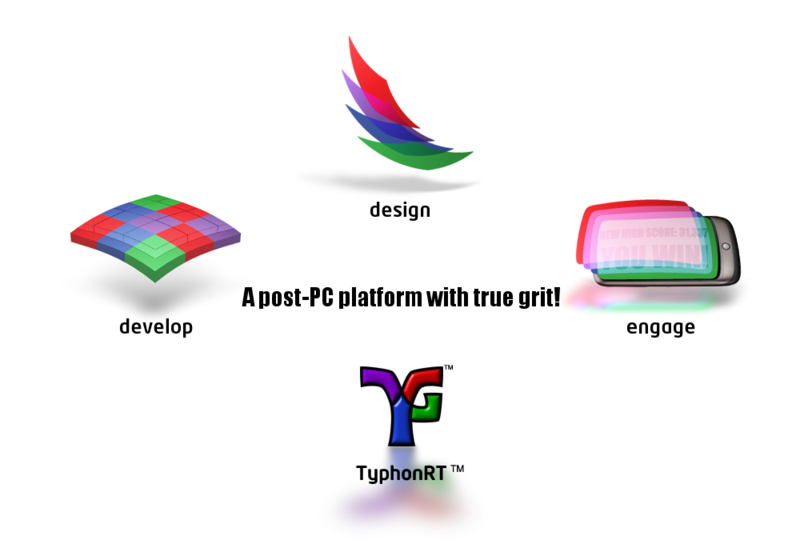 TyphonRT is a modular runtime middleware platform with a client SDK for app development that delivers a new approach to creating desktop J2SE, Android, and cross-platform OpenGL / OpenCL enabled apps. The architecture is based on high and low level DOD (data oriented design) concepts with a primary focus on COP (component oriented programming) as a central high level organizational mechanism versus traditional OOP approaches. In short, this approach focuses on indirect message passing and the implicit has-a / composition relationship instead of deep inheritance hierarchies. A component oriented architecture allows the TyphonRT platform to be configured across the J2SE (6.0+) and entire Android ecosystem (Android 1.5+). Not only is the platform modularly oriented with optional and forthcoming OSGi support, but the TyphonRT client SDK provides a lightweight and fast implicit query API that facilitates advanced app construction applicable to any app class from business / enterprise to real time apps & games including custom graphic / game / video engine development. A unique feature of TyphonRT in regard to game development is that the component architecture is a superset of a well defined entity system. Many non-trivial entity system use cases continue to be throughly vetted. TyphonRT features a library of components and a future goal is the launch of a component marketplace that eventually will be open to all developers including 3rd parties who may distribute and sell open source or commercial components and runtime environments compatible with TyphonRT. In addition design friendly editors and tools with an intuitive work flow are planned for release that allow designers to visually create engaging content. An in depth set of tutorials for developers and designers covering DOD / COP techniques for business apps and advanced real time app and game development including the "dark arts" of real time Java app creation is planned upon launch. Send an email to contact[-a*T^]typhonrt.org (remove spam block) to receive updates and semi-public early access announcements on the upcoming launch of TyphonRT. TyphonRT has been in development since 2003 for the desktop and porting to Android started on the launch of the G1 in October 2008. The past few years have been full of innovation for TyphonRT in an effort to overcome many of the ecosystem issues with Android from fragmentation concerns to providing a stable and feature rich client SDK that runs across the J2SE and entire Android ecosystem freeing developers to focus on unleashing unbridled creativity versus wrestling with systemic concerns. The public release is imminent and we appreciate your patience as we prepare TyphonRT for public launch. TyphonRT is a product from and supported by EGR Software.